As a developer famed for creating a slew of games that have earned them no short supply of notoriety and wealth, Bioware probably haven’t worked on a project as important to them as Star Wars: The Old Republic. How could I make such a bold claim though? Here is a developer responsible for some of the finest single player Role Playing Games this last decade. Mass Effect, Dragon Age, Jade Empire and, of course, Knights of the Old Republic where each milestones and clear examples of how well Bioware craft RPG’s. How could I claim that these all somehow pale to something yet to be released? Well, I’m not. I’m simply highlighting one very big obstacle Bioware has to overcome: diving head first into the shark infested sea of the MMO genre, and being able to come out with all limbs in tact and a profitable enough subscription base to pay back the purported millions it cost to create SWOR. It’s a task made unenviable by the dominance of one game in particular. A game that has chewed up and spat out countless pretenders and still reigns as champion of them all. I won’t make mention of it’s name because, frankly, if you don’t know it by now you’ll have other things to worry about in your attempts to escape from that rock on the moon you’ve obviously been trapped under. These days simply having a good idea, or even the universally appealing Star Wars name behind you, just isn’t enough. And it is still appealing, even after the cinematic travesties of the recent prequel trilogy (you can claim they where “OK” if you like, but you’ll still be massively wrong.) And where better than the MMO to replicate all of those childhood fantasies of becoming a Jedi Knight or Han Solo-style renegade? Well, except a nice single player adventure game sequel to a well respected series that has been crying out for a successor for years, but we’ll have to learn to live without Knights of the Old Republic 3 for the time being. Realising that even this wouldn’t be enough of a guarantee for success (take a bow Star Wars: Galaxies) Bioware are instead drawing on years of experience from their single player RPG’s and are attempting to combine what they’ve learnt developing for the solo player with that of the unpredictability and openness of massive online gaming. The results sound interesting on paper. Taken at face value, SWOR doesn’t appear to stray too far from the typical workings of the genre. It’s art style is even reminiscent of “The Game Who Shall Not be Named…. Craft” with simplistic graphical effects and slightly distorted cartoon inspired character models. Dig deeper however, and you begin to see the innovations hiding beneath. Innovations that have as much a chance of failing as they do at succeeding. The most prominent of these is the narrative. Yes, there’s a story here, driving your actions to an eventual goal. Every one of the playable classes is given a back story, and in that fine Bioware tradition, numerous twists, turns and revelations guide you through to it’s conclusion. Interactions with None Playable Characters (NPC) will extend far beyond simplistic time wasting tasks (though don’t expect SWOR to ditch filler quests entirely), with every character in the game – including players – receiving fully voiced dialogue. It’s an intriguing spanner in the cogs of what MMO’s usually do. Just hand you a sword and shield and have you adventure at will, while the story and lore occasionally tap you on the shoulder to remind you they still exist. But more than that, it instills a sense of purpose, a reason for you being there beyond the accumulation of new weapons and shiny armour. Where MMORPG’s falter is in their inability to really embrace their ‘Role Playing’ aspect. Shoving you out into a world and simply leaving everybody to wander aimlessly around with no real end goal beyond grinding later dungeons. Having a story might give focus for those searching for a more meaningful online experience, but there remains one big potential problem with this. As a genre famed for it’s open-ended nature, players doesn’t finish their days in a particular online fantasy land until they decide to leave, and that usually occurs long after the wonderment of discovery and exploration have waned. There still remains a question mark over how Bioware will maintain interest in SWOR long after the back stories have run their course. And while their credentials at storytelling are certainly up to scratch, it’s still far from certain that having such a huge focus on plot and character development will work at all. It’s at least offering up some genuine intriguing approaches to familiar formulas. Flashpoints (or dungeons if you’re a traditionalist) stick to the predictable pattern of funnelling small groups of players down linear corridors full of tough opposition, stopping off every now and again for a friendly chat or a light sabre smash to the face with the local boss. Again, however, the story claws it’s way in. A reason is given for your presence in these instanced off areas, dialogue will be intensive as will the presence of cut-scenes. But it’s the potential to get involved with the unfolding events that piques interest. The aforementioned cut-scenes will on occasions allow direct interaction, much in the same way as conversations are handled in the Mass Effect games. There are consequences to choosing certain responses though. Picking the “right” line of dialogue for instance, could potentially lead to the unlocking of a path that takes your group to the next encounter with fewer obstacles to bypass. The “wrong” dialogue choice will inevitably lead to the opposite, and could potentially see you all fighting off a new wave of enemies. The kicker is that who makes that choice is random. The Flashpoint picks one of the group to initiate conversations and leaves them and them alone to make the tough choices. How Bioware will tackle the problem of repeated flashpoint runs is still up in the air. As numerous as the dialogue options may be, there is bound to be a time when all that can be said will have been. By then, the surprise of learning what happens next will become a hindrance, as players will have discovered and memorised where each dialogue choice arcs off towards. Yet as far as features go, it remains an interesting deviation from the norm. 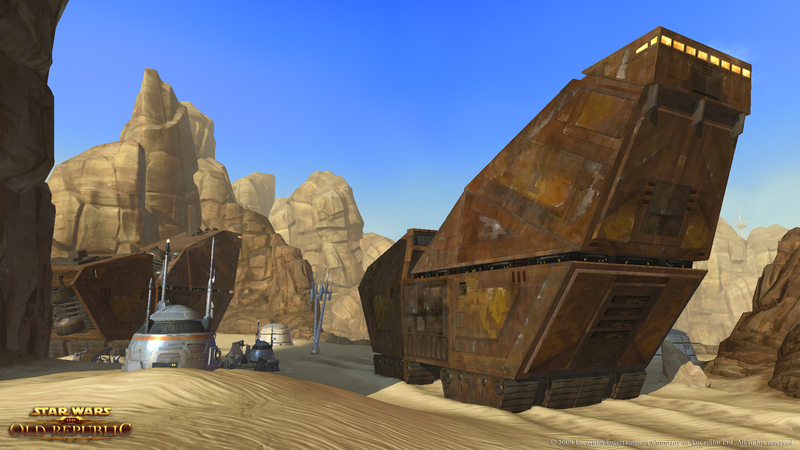 It’ll essentially allow SWOR’s dungeons to feel less like them park rides and more as actual events. Leaning towards single-player games for inspiration doesn’t just benefit group play either. Soloing still plays an important part, and here at least it no longer needs to be done alone. Allow me to clear up that confusing, contradicting statement. Solo players can acquire the company of AI companions, or slaves if you lean towards the dark side, as it’s their responsibility to handle the tedious work of the crafting system. Instead of burdening yourself with a pointless workload to create items, up to five companion can be assigned to gather resources and build things of use while you’re off being the heroic/sadist type. Another nod to Bioware’s desire to do things differently where so many have fallen in line and simply repeated. Companions won’t be passive either, and because it’s unavoidable, here’s another comparison to Mass Effect: like that game each will have an agenda. They’re with you for a reason. Perhaps for a sense of adventure your journey rewards them with, or out of plain old greed. Some even shroud themselves in secrecy, not letting on why they’ve joined your cause until much later. And there’s a nice diversity in the range of companions who join you. Droids, aliens, pirates and even royalty, all drawn from the huge supporting cast of characters from the Star Wars movies. But they won’t ignore your leanings towards the light or the dark side. Action will have consequences and depending on how you approach certain situations, they can either end up becoming trusted allies, or mortal enemies. And yes, you can romance them. 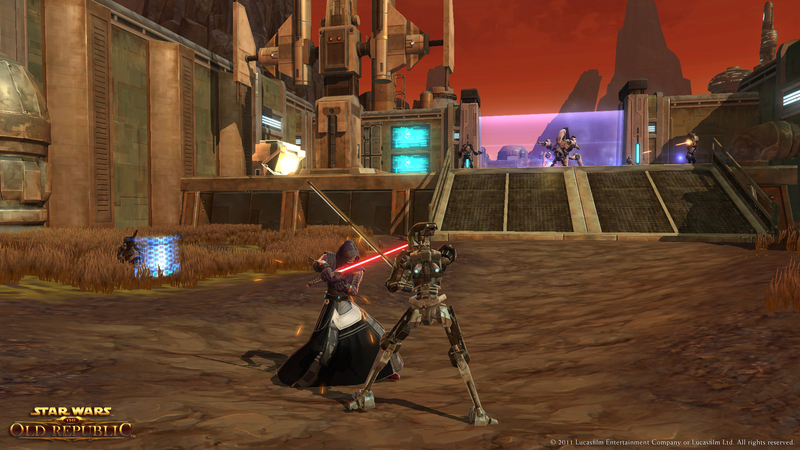 Yet at the core of The Old Republic is a game that still sticks to some fundamental basics of the genre. Being by-the-numbers is no bad thing, especially when there are many features here that look to shatter the predictable. And yet, some features do seem to come across as “safe” rather than inventive. Specifically, the classes all seem to fall into rather comfortable templates. Each also allies under either the Jedi or Sith, giving the game two opposing factions and adding plenty of opportunities for some Player versus Player confrontations. So there are still DPS (damage dealer) classes, casters and tanks with each unlocking specialisations at later levels. Taking aside the fact you can play as a lightsabre wielding, force power spewing Jedi Knight or Sith Lord, nothing much stands out as new. 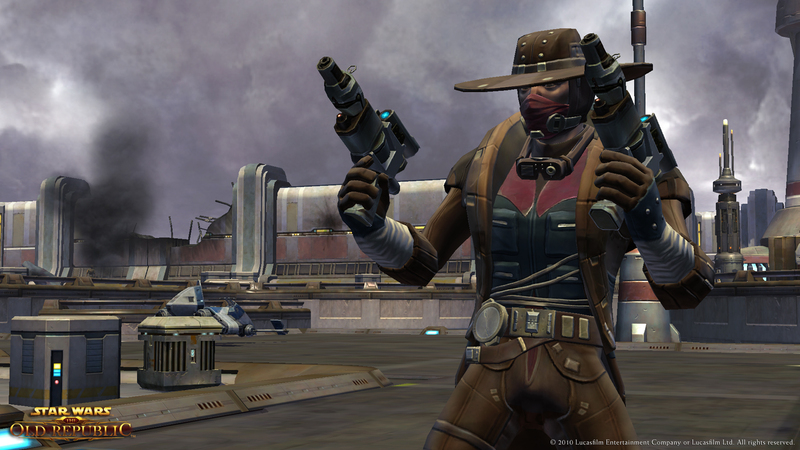 That is until you see the Bounty Hunter and Smuggler in action. 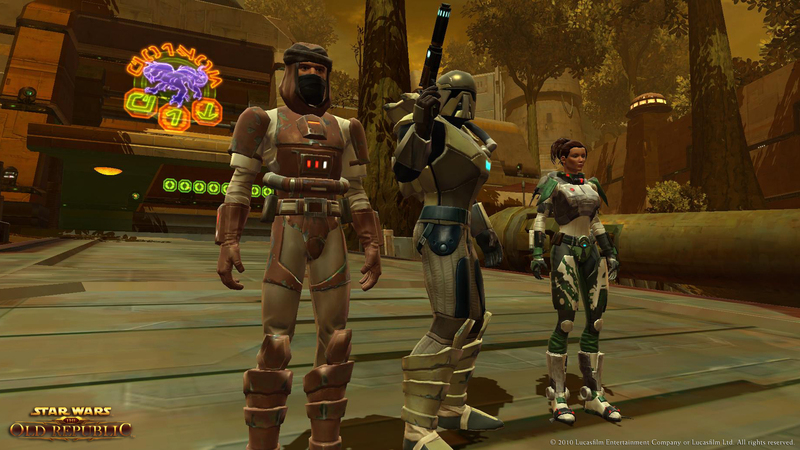 Based on popular Star Wars characters – as are all the classes – both seem more at home in an action game than a massive online role playing one. The Bounty Hunter (Bobba Fett for you non-Star Wars nerds out there) as well as having arguably the best job in the galaxy (basically dog the bounty hunter is space) is a firearms expert who relies on heavy ordinance to slay opposition. He can also utilise a jet pack to jump in the air and spray foes from an advantage point others can’t access, before dropping down and hitting them with an arm-mounted flamethrower. The Smuggler (that’ll be your Han Solo archetype) instead favours agile manoeuvrability and duel wielding laser pistols. He’s also the only class who steals Mass Effects cover system to protect himself from incoming fire while suppressing attackers. Distinctly action game trappings, of all the classes these two stand out the most if only because they offer something different. How well they, or the other classes, will eventually stack up against one another is yet another feature we’ll have to sit and wait on. We’ll also have to wait to find out how well or how badly the “Space Combat” system will be implemented, though calling it space combat does seem to be a bit of a misnomer. While many of us still hunger for a developer to realise the potential of the untapped and sadly dead genre of the space sim, the prospect of fighting through SWOR’s vast expanse of space has given way to slight disappointment. It’s not something that will be as open as many imagined, or would have liked it to be. Instead, it’s a linear tunnel shooter, in which you simply control the movement and weapons, but not the speed of your ship. 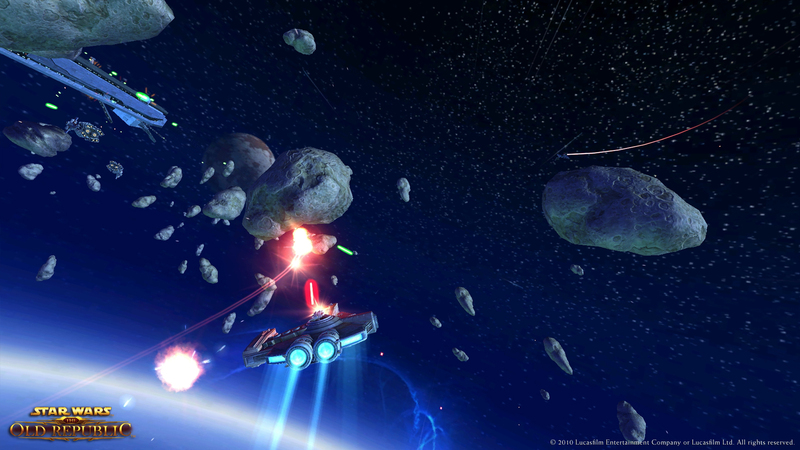 As an arcade game it certainly looks the part, but there’s still that nagging feeling that something more along the lines of the classic Lucasart’s developed X-Wing or Tie Fighter series would have been far, far better, particularly given the prospect of vast PvP space battles, and especially when Star Wars: Galaxies provided that years ago. It’s another feature we’ll have to shelve with the note “not quite sure yet.” So much of what Bioware are doing with The Old Republic is both exciting in the freshness they seem to be bringing to the genre, and potentially soul crushingly disappointing with features that at this stage could go either way. What worked for them in a single player game might not necessarily work as well or at all online. And given how difficult a genre the MMORPG is to develop for (let alone simply survive in) their talents and vast back catalogue of critically lauded titles is no sure guarantee for success. Yet whether or not The Old Republic ends up a commercial triumph or a complete flop, it’s refreshing to see a developer challenge the conventional wisdoms of a genre so often stuck under the shadow of “World of Money Eating, War on Social Life Craft,” with changes that genuinely excite and look to improve on a stale format. And, you know, it’d be nice for someone to make us all like Star Wars again. Love Star Wars and that’s why I won’t be able to play this game…….it could very realistically end my relationship and my social life.